Honestly, I've really enjoyed most every book I've ever read by Rachel Van Dyken. Of course for me some have been better than others, but I attribute that to personality and what I look for in a book. Rachel is amazing at writing Rom-Com - hand's down my favorite. Inevitably she always manages to not only keep my attention but I also find myself literally laughing out loud more in her books than with any other author. Some of her books are over the top and I have to just know that is her style and keep going. I enjoy some craziness but not when it overpowers the storyline. All that being said I just have to tell you that Cheater is the absolute perfect mix of romance and comedy and while some things are over the top, it isn't too much, its actually just the right amount! I promise I'm not exaggerating, I genuinely loved every single minute of this book and it will be one I read and read again. 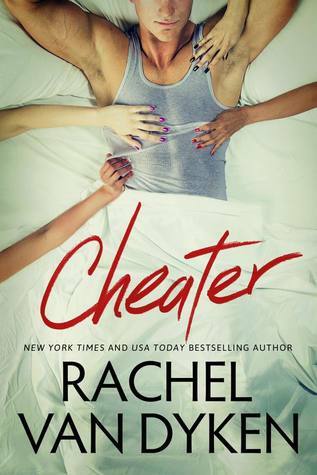 Some people will look at the title of Cheater and automatically decide this book is not for them. I urge you to put your preconceived notions aside and give it a chance. Is there angst? Yes, but it's not the kind you'll be expecting. This book is not a love triangle and it really isn't necessarily about a character who just took on the label and ran with it. Lucas Thorne was labeled bad guy for "cheating" on his fiancé with her sister - yikes he kind of does sound like a bad guy! Obviously there's more to his side of the story, but instead of trying to explain Lucas just decides since everyone thinks he already is a cheater he might as embrace the role. He has a different girl for every day of the week and they all know about each other, therefore none of them can be angry. This routine has worked for many years, it's the prefect solution for keeping emotions in check and attachments at arm's length. But that was all before before Avery Black's reappearance into his life, before she took a wrecking ball and destroyed all the walls he was working so diligently to keep built. Avery Black is the youngest sister to Lucas Thorne's ex-fiance. She accepts a job as a paid intern only to find out she will be the assistant to the devil himself - clearly she wouldn't have even applied if she knew the Lucas Thorne would be her boss! I love Avery. It's that simple, the girl has wit, guts, is compassionate and kind, quirky and fun with a heart of gold. She is the total package and when the two are first re-connected sparks fly, it's clear she and Lucas have some sort of history. Avery has this pull on Lucas he can't seem to push away nor can he stay away so when the inevitable web of deceit tangles the two it is pure Rom-Com gold from there. If you are looking for a fun, light-hearted read that will keep you smiling, this book is for you. Don't let the title scare you. You are going to love Lucas Thorne - hands down this will without a doubt make the short-list as one of my most favorite RVD books.